Is SeanieMac International Ltd (OTCMKTS:BETS) poised to go from subpennies to penny or more? Given the new acquisition, the stock could gain 300%, 500%, or more from current levels given the new developments going on with BETS which gained over 35% last week alone. It has already risen almost 300% from its 52-week low and is making significant headways. Last week volume broke out with almost 17 million shares trading hands which is more than 8.5 times its daily average volume of only 2 million. Clearly, something is going on with BETS and it is poised for more. On February 10, 2016, BETS acquired the assets of Apollo Betting and Gaming Ltd (“Apollo”), an online gambling and betting business carried on by Apollo in the United Kingdom. Under the terms of an agreement BETS subsidiary SeanieMac Holdings Ltd. (“Holdings”) and Apollo, agreed to pay Apollo a total of $2,000,000, as follows: (i) $80,000 was paid at the closing; (ii) $10,000 within 2 business days of the date on which Apollo delivers to us audited accounts of Apollo for the year ended March 31, 2014; (iii) $10,000 within 2 business days of the date on which Apollo delivers to us audited accounts of Apollo for the year ended 31 March 2015; and (iv) $1,900,000 upon the migration of the acquired business onto a new operating platform which is capable of delivering the online betting services provided by Apollo in substantially the same way as provided by Apollo as of the closing, and the successful use of the new platform in connection with a bet placed by any person who is included on Apollo’s database of customers as of the closing, with the amounts payable being paid from the combined net profits of Holdings and SeanieMac Ltd., which is also a wholly owned subsidiary of our company. According to a recent filing, BETS stated the following regarding liquidity. In order to continue to operate its business, BETS estimate will require working capital of a minimum of approximately $2,650,000. Of this amount, $1,900,000 will be used to pay the balance of the purchase price for the assets we acquired from Apollo and $750,000 for website operations, marketing expenses and general and administrative expenses. These amounts do not include funds for payment of their debts. As of September 30, 2015, related parties lent BETS approximately $1,039,584 in order to fund 2015 working capital requirements. While related parties may continue to lend BETS funds the company has not entered into any agreements. In the event BETS are unable to borrow funds needed for its business, or unable to repay its current obligations when due, it will have to seek additional financing. Failure to do so could cause the end to bets. Recently, BETS filed an 8-k statement with the SEC where the company entered into a definitive agreement. SeanieMac International Ltd (OTCMKTS:BETS) issued to Apollo Capital Group, LLC (“Apollo Capital”) a Convertible Promissory Note (the “Note”) in the original principal amount of $35,500 (the “Purchase Price”) which Note bears interest at 12% per annum and is compounded daily. The Company sold the Note to Apollo Capital for $30,000 with $5,500 retained by Apollo Capital as an original issuance discount for due diligence and legal expenses related to the transaction. 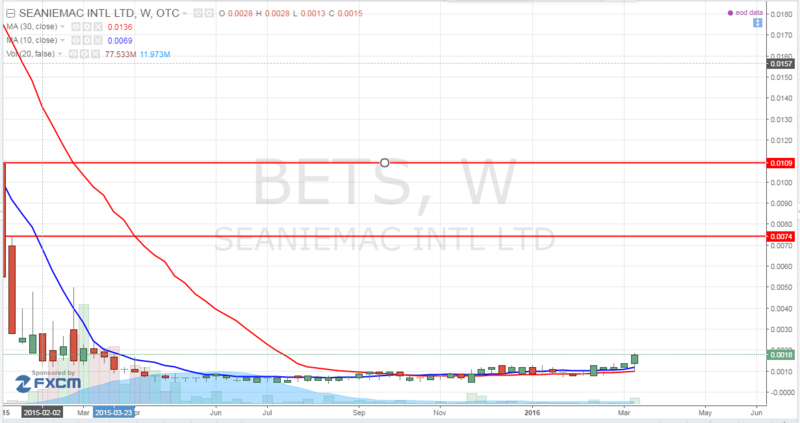 SeanieMac International Ltd (OTCMKTS:BETS) is engaged in maintaining a Website for online gambling, including sports betting and casino gaming. The Company, through its Website and mobile media, offers sports betting, casino games and slots in Ireland under its Seaniemac.com brand. The Company’s Website menus include Irish horse racing, soccer, online wagering for traditional casino, live casino, poker, bingo and interactive skilled games. BETS businesses focus are the operation and expansion of its online gaming Website Seaniemac.com. On March 16 BETS (last year) announced that LG Capital Funding II, LLC has issued A Final Conversion on its Convertible Debenture issued July 14, 2014. BETS also announced WHC LLC issued its Final Conversion on its Convertible Debenture. The fact that BETS is clearly committed to eliminating the toxic debt that has plagued this stock and decimated the share price great news for shareholders of BETS. BETS is currently trading at a $1.4 million market valuation. The company is showing signs of turning around from a technical chart perspective and its most recent acquisition shows that BETS is making strategic moves to grow its business. One issue is the fact that the company does not have enough cash to pay off the acquisition, so unless the company can borrow the money it will have to probably raise dilutive financing agreements. Stay tuned as we find out more and find more developments. We will be updating on BETS when more details emerge so make sure you are subscribed to Microcapspot so you know what’s going on with BETS. Disclosure: we hold no position in BETS either long or short at the publication of this article and we have not been compensated for this article.